Sand dunes shimmer in the sun as far as the eye can see, and somewhere between them is a hidden oasis… Befriend the Master of the Oasis and bring his treasures home. 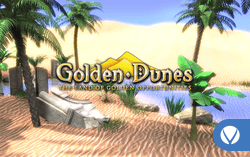 On this online slot machine, golden dunes glitter in the sun – and somewhere in the desert is a hidden oasis. Become friends with the Master and test your luck by playing for the hidden treasures of the online casino desert. The path through the desert is long and full of privations. And there are almost as many paylines on this online slot machine as there are grains of sand in the desert. Okay, that’s a shameless exaggeration, but you will have to look hard to find 25 paylines on 5 reels elsewhere! Golden cobras and deadly scorpions are your only company along the way, but if you’re lucky, you might meet up with a seductive enchantress or find the hidden oasis. Three symbols in a row from left to right on any payline win, and only two enchantresses, treasure chests or scorpions are even enough to make it at least rain coins in the golden dunes. Follow the compass of faith at our legal online casino. It is the wild card and substitutes all of the other symbols except the scatter symbol (we’ll come back to that later). It even stands in for the Master of the Oasis, who triggers the bonus feature. In this case, the Master must appear at least once in person on the payline. Combinations made up entirely of compasses don’t count as bonus symbols when you play Golden Due online. If you languish in the desert of this online slot machine long enough, you will meet up with the Master of the Oasis sooner or later. But only when you are so hot that you see three of him in a row on a payline will he be merciful enough to lead you to the treasure hunt in the hidden oasis. There, the enchantress awaits to seduce you with 20 glittering artefacts of which you may choose five. But you only find out what the junk is worth after you have made your choice. If you are of the opinion that it should be worth more, then you have one last chance to barter and change your selection. If the Master appears to you even more than 3 times in this online slot game, it’s not a sign of increasing weakness – it means that your luck is great, and you can choose from even more of the treasures in the oasis! If, instead of the usual vermin, you meet up with at least three lost treasure chests (the scatter) on your trek through the desert, then it’s your lucky day. Now you have earned free water rations. Well, at least metaphorically. Seriously though, what you really get are 10 free spins, and your winnings are even tripled when you gamble online and win! Come to our state certified, legal online casino to search for hidden treasure, and don’t worry if you see multiple oases and mirages in the desert – they bring you luck!